Here are some great tips to help you estimate how much you'll get by selling jewelry, whether it's gold, silver or platinum. If you've inherited a small collection of jewelry, or you're ready to get rid of those rings and necklaces you never wear, you're probably wondering what's worth selling, if anything. To help you get started, this is a primer on diamonds, platinum, silver and gold jewelry, including what you can expect to receive, depending on where you sell. A note: We'll refer to the gram price of jewelry because most jewelry is only a few grams. You'll see the price for precious metals is listed by the Troy Ounce, however, so remember that 1 Troy Ounce is equal to 31.109 grams. Silver is a beautiful, strong metal that's also very affordable. You'll know you have real silver jewelry if you see a stamp that says .925 or .999, which indicates the percentage of silver in the jewelry. Silver usually sells for under $0.25 a gram so even a heavy chain won't be worth much. In fact, many pawn brokers don't even buy silver because they can't offer you much. If you're selling fine silver jewelry, your best bet is an estate jewelry buyer who wants your jewelry as a whole piece and won't give you a price based on the scrap value. Gold jewelry, which may be the traditional gold color, white, rose or even green, is the most common metal for jewelry and one of the most valuable. Gold is valued by karats, so 24 karats, or 24k, represents pure gold, although it's rare to make jewelry with pure gold because it's a soft metal. Most jewelry is 10k, 14k or 18k. Because gold is so soft, other metals are mixed in to give strength, including copper, silver and zinc. Gold sells for as high as $51 per gram -- if it's pure. Of course, you probably don't have pure gold jewelry so you can use this equation to quickly determine the market value before you sell gold jewelry. So, if gold is selling for $51 a gram and you have a 14k ring that weighs 3 grams, it would be worth $63.75. This is the value of the precious metal in your ring but remember, a pawn broker or gold buyer will only give you a percentage of this, which will vary. Depending on your piece, you should also get an offer from an estate jewelry buyer who specializes in buying whole jewelry, not offering scrap values. Platinum is difficult to work with but it's very strong. It's commonly used to create a durable setting in silver or gold jewelry to hold diamonds and prices for this metal fluctuate a great deal. You have platinum jewelry if you see a jeweler's stamp that says Pt or Plat with an abbreviation, group metal or number. For example, a ring that's 85% platinum and 15% iridium may be stamped as "85 Plat Irid." Platinum is selling for about $50 per gram now. Diamonds truly deserve an article of their own so click here if you want to find out more in-depth information about how the value of a diamond is determined. If you're planning to sell diamond jewelry, keep in mind most pawn shops pay very little for diamonds. Many buy by the point (which is equal to .01 carats) and only pay about $1 per point. This means you would only get around $140 by selling a diamond engagement ring to a pawn shop if your ring made from 14k gold with a 1 carat diamond. The pawn shop, on the other hand, would then sell your ring for up to 5 times that amount. If you're trying to sell diamond jewelry, it's best to go to a diamond buyer who has experience grading diamonds. Diamond buyers specialize in diamonds -- not gold -- with years of experience grading your diamond's cut, clarity, color and carat to give you the highest and fairest price. We are not a jewelry store, pawn shop or gold smelter. South Florida Jewelry Buyers is a family-owned business founded in 1983 to serve all of South Florida as a wholesaler and manufacturer of diamond jewelry and loose diamonds. 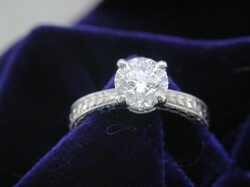 We specialize in buying large diamonds and we'll offer you the most competitive rates around! Give us a call to schedule an appointment with a GIA-certified gemologist if you want to sell jewelry in Miami. Live outside South Florida? Contact us and arrange to sell your diamonds. We'll do a preliminary consultation over the phone or through email and make an offer. I sometimes think of my jewelry as potential emergency cash - but I am not sure I will be able to bring myself to sell it when it comes down to it. Too much sentimental value. Victoria Kay Jewelry makes the Perfect Gift for your loved ones!